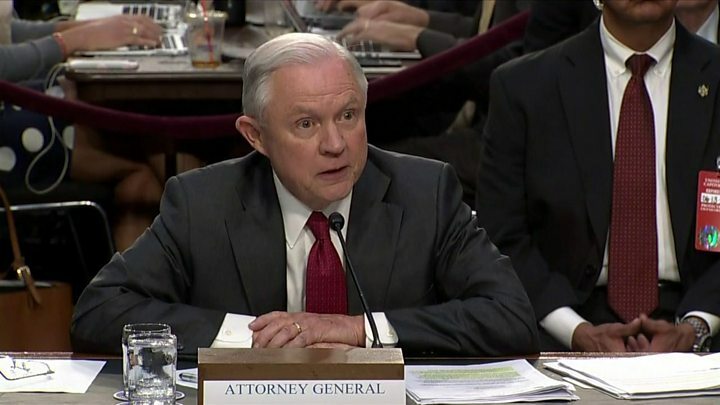 US Attorney General Jeff Sessions has denied during a Congress hearing having undisclosed meetings with Russian officials at a Washington DC hotel. America’s top law official also told the Senate Intelligence Committee any suggestion he colluded with the Kremlin was “an appalling and detestable lie”. Mr Sessions also repeatedly refused to answer questions about his private conversations with the president. Mr Sessions’ remarks came after sacked FBI boss James Comey said he believed he was fired to influence the agency’s investigation into Russian political meddling. US intelligence agencies believe that Russia interfered in the election in order to help Republican President Donald Trump get elected. Mr Sessions, the country’s top law enforcement official, told the Senate committee he has never received a classified briefing about Russian meddling in last year’s election. He also vehemently denied speaking to Russian officials about the election, during a campaign in which he was a close adviser to candidate Trump. “I have never met with or had any conversation with any Russians or any foreign officials concerning any type of interference with any campaign or election in the United States,” he said on Tuesday. Mr Sessions acknowledged he met Russian Ambassador Sergei Kislyak twice, but suggested he could not remember whether he met the envoy at a foreign policy speech event for then-candidate Mr Trump at the Mayflower Hotel on 27 April 2016, as US media have reported. The former Alabama senator also denied media reports that he offered his resignation when Mr Trump was reportedly angered by his recusal from the FBI Russia probe, telling the panel he “will not be deterred”. Mr Sessions was often evasive and his accounting of details uncertain, littered with “I don’t recalls” and “I have no recollections”. He is far from the first politician to seek refuge in a fuzzy memory under sharp questioning. Definitive statements proven inaccurate under oath are more prone to accusations of perjury. 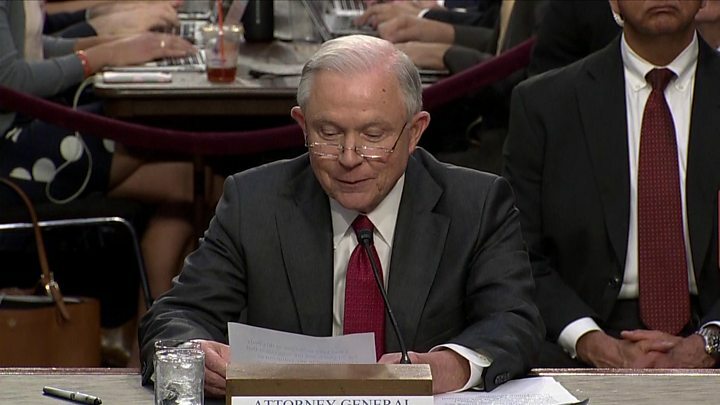 When it came time to discuss his conversations with the president, Mr Sessions demurred, noting that he wanted to give Mr Trump the opportunity to review the question before sharing his thoughts. It was as if the attorney general was trying to pre-emptively invoke executive privilege – the right of a president to candid counsel from his advisers – without using those magic words. Where Mr Session’s memory does serve, he forcefully condemned allegations of Russian collusion as “appalling and detestable”. The controversy at this point is about more than just collusion, however. It’s about obstruction of justice and the circumstances around the firing of an FBI director. In those areas the attorney general did little to turn down the heat. Vice-Chairman Senator Mark Warner, a Democrat, pressed Mr Sessions about his role in the sacking of Mr Comey. Mr Sessions said he never spoke to the former FBI director, who reports to the US attorney general, about his job performance before Mr Trump fired him in May. But Mr Sessions did confirm Mr Comey’s assertion that he told the US attorney general that he felt uncomfortable speaking directly to Mr Trump in a one-on-one setting. Several Democratic senators expressed frustration because Mr Sessions repeatedly refused to answer questions relating to conversations he had with the president, saying they were confidential. Similar answers were heard last week during testimony from the US intelligence chiefs before the same panel. US Director of National Intelligence Dan Coats, National Security Agency chief Admiral Mike Rogers, acting FBI Director Andrew McCabe and Deputy Attorney General Rod Rosenstein were criticised for refusing to respond to some questions in a public hearing. But Mr Rogers on Tuesday “thoroughly answered the committee’s questions in a closed setting on Monday night, Chairman Richard Burr said.